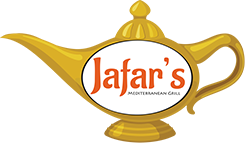 Jafar's Mediterranean Grill located in historic downtown Van Alstyne is a classic authentic Mediterranean restaurant. Our basic tenets are the enjoyment of food, and the respect and pleasure of food. 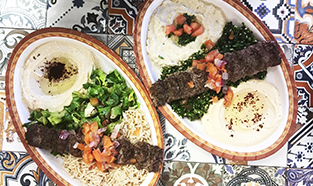 North Texas' Classic Authentic Vegan, Lebanese and Mediterranean cuisine. 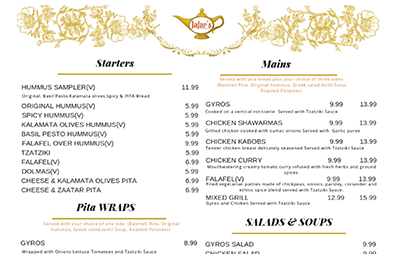 Try our signature Chicken Shawarma or our amazing Falafel with Fatoush Salad and Hummas! Everything is prepared fresh daily, and our menus are filled with enticing choices. Our signature Kabob platter with authentic Mediterranean flavor. From our signature dishes to our vegan options, our Lebanese, Greek and Mediterranean cuisine is always prepared fresh daily. 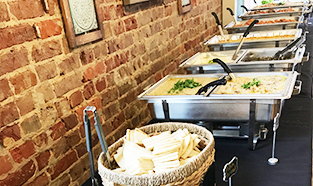 Let Jafar's Authentic Mediterranean Grill cater your next private party or event. Want authentic Mediterranean catering for a private party or event?